The current version of SOLWEIG is v2018a (released 19 October 2018). NEW in this version: see Version History. F Lindberg, CSB Grimmond 2016. SOLWEIG_v2018a Department of Earth Sciences, University of Gothenburg, Sweden, University of Reading, UK. SOLWEIG is a model which can be used to estimate spatial variations of 3D radiation fluxes and mean radiant temperature (Tmrt) in complex urban settings. The SOLWEIG model follows the same approach commonly adopted to observe Tmrt (as used, for example, by Höppe (1992) , with shortwave and longwave radiation fluxes from six directions being individually calculated to derive Tmrt. The model requires a limited number of inputs, such as direct, diffuse and global shortwave radiation, air temperature, relative humidity, urban geometry and geographical information (latitude, longitude and elevation). Additional vegetation and ground cover information can also be used to imporove the estimation of Tmrt. Below is a flowchart of the model. As SOLWEIG is included in UMEP (as from version 0.2.1) follow the Getting Started on how to install QGIS and UMEP. When installed successfully, SOLWEIG is found under UMEP -> Processor -> Outdoor Thermal Comfort -> Mean Radiant Temperature (SOLWEIG). There are two categories of data needed to run SOLWEIG. The first category is the spatial information in the some various raster grids explained below. The other is meteorological data and other settings such as environmental and human exposure parameters. One essential prerequisite for performing successful model calculation is that all surface models are of the same extent and pixel resolution. As the name suggest this DSM consist of both ground and building heights (masl). 3D Vegetation is described by two different grids. First a canopy DSM (CDSM) which represents the top of the vegetation and second, a trunk zone DSM (TDSM) that describes the bottom of the vegetation (see schematic figure). Pixel without any 3D vegetation has the value of zero and vegetation pixels are given in magl. For a detailed description, see Lindberg and Grimmond (2011) . By including a DEM which can bu used in conjunction with the ground and building DSM to derive building pixels. By using a land cover grid (see below) where buildings are represented. If a DEM is used, is has to be the same spatial resolution and extent as all the other grids used. Required are also the components of diffuse and direct shortwave radiation. If these are unavailable, and submodel developed by Reindl et al. (1990)  is included in SOLWEIG. Direct radiation perpendicular to the solar beam should be used. Four main environmental parameters are mandatory; albedo and emissivity of ground and walls. For building walls, these are bulk albedo values with a default of 0.20 (albedo) and 0.90 (emissivity). If the ground cover scheme is not used the bulk ground values are 0.15 (albedo) and 0.95 (emissivity). If the ground cover scheme is activated (specific tick box found in the plugin-interface), the variables for albedo, emissivity and how surface temperature is parameterised for different surfaces is found in landcoverclasses_v2016a.txt. For as detailed description of the ground cover scheme, see Lindberg et al. (2016) . landcoverclasses_v2016a.txt can be found in C:\Users\your_username.qgis2\python\plugins\UMEP\SOLWEIG. It should be noted that it is only grass and impervious surfaces that has been parameterisised and evaluated. Other surfaces such as bare soil and water are only first order approximations at this point. The original model as described in Lindberg et al. (2008)  used an adjustment of sky emissivity (Jonsson et al. (2006)  calculated using the method presented in Prata (1996) . This is now removed but can be added as an option. As from version 2015a it is possible to consider the human as a cyliner instead of a box. See Holmer et al. (2015)  for more details. There are two forms of output available, calculated grids of various parameters and full model outputs from certain point of interests (POIs) within the model domain. A post-processing plugin (SOLWEIG Analyzer) for the output grids are planned to be included in future versions of UMEP. The following section provides information on how to run the model and what consideration that should be taken into account in order for the model to perform at its best. Before running the model for your own data it is good to make certain that you can run the test data and get the same results as in the example files provided. Test/example files are given for Göteborg, Sweden or London, UK. Here, you will use the Göteborg data. Download and extract the test dataset to your computer (testdata_UMEP.zip). Add the raster layers (DSM, CDSM and land cover) from the Goteborg folder into a new QGIS session. The coordinate system of the grids is Sweref99 1200 (EPSG:3007). 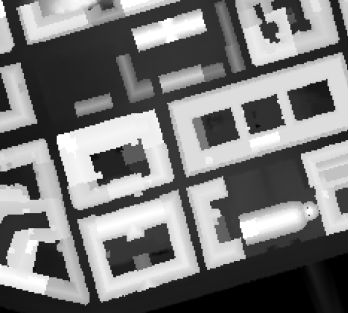 In order to run SOLWEIG, some additional datasets must be created based on the raster grids you just added. Open the SkyViewFactor Calculator from the UMEP Pre-processor and calculate SVFs using both your DSM and CDSM. Leave all settings as default. This calculation produces a file called svf.zip’ which is used later in the calculations. Open the Wall height and aspect plugin from the UMEP Pre-processor and calculate both wall height and aspect using the DSM and your input raster. Make sure to add the result to your project. Now you are ready to generate your first Tmrt map. Open SOLWEIG and use the settings as shown below but replacing the paths to fit your computer environment. When you are finished, press Run. All grids must have the same extent and pixel resolution. The coordinate system of all the grids must be the same and translatable to lat, lon coordinates. Meteorological file must have the default UMEP format. Wall height and aspect grids as well as SVFs can be calculated from Pre-processor in UMEP. The model is very sensitive to the timing global radiation, i.e.. that the peak of solar radiation occurs at local noon. If using a meteorological file included a longer dataset, this could be checked by comparing the global solar radiation and the theoretical maximum of solar radiation (I0) from a solar exposed point of interest. Land cover grid should be in UMEP format. A boolean building grid (building = 0, ground = 1) must be present, This grid is created either from a land cover or a ground DEM in conjunction with the building and ground DSM. If using the land cover grid to derive the building grid, it is important that it coincides with the ground and building DSM. Otherwise strange results will be produced. SOLWEIG focus on pedestrian radiation fluxes and it is not recommended to consider fluxes on building roofs. FORMAS, National Science Foundation (USA, BCS-0095284, ATM-0710631), EU Framework 7 BRIDGE (211345); EU emBRACE; UK Met Office; NERC ClearfLO, NERC TRUC. Participate in Coding or adding new features DevelopmentGuidelines. v2018a Minor bug fixing in ground view factor calculation. Introduction to PET and UTCI calculations for POIs. Available only for QGIS3. v2016a First version released within UMEP. Python version of model is now released as open source. The time stamp is now ‘fixed’ i.e., 1400 in an hourly dataset represent the hour before. 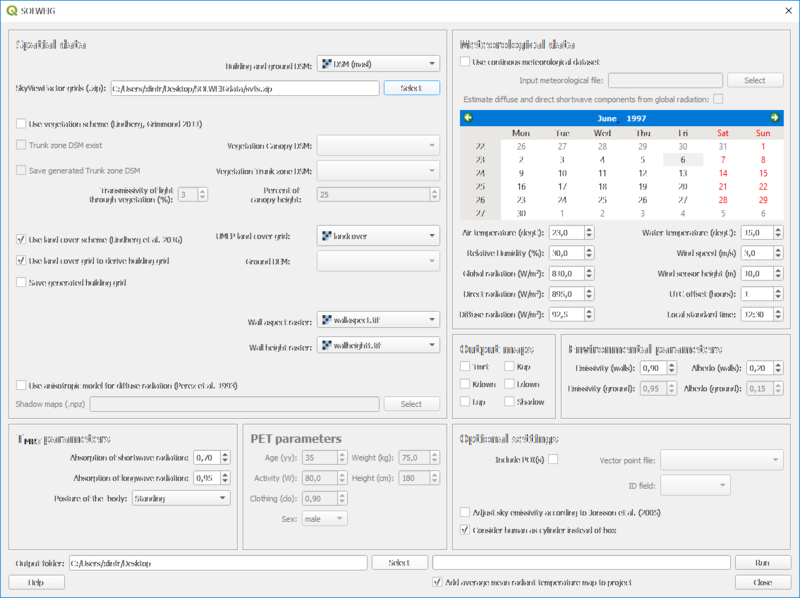 2013a A new GUI is introduced as well as options to load gridded vegetation DSMs. 2.0 A new vegetation scheme is now included (Lindberg and Grimmond 2011). The interface also has a wizard for generating vegetation data to be included in the calculations. The new vegetation scheme is again slowing down the calculation but the computation time is still acceptable. 1.1 Longwave and shortwave radiation fluxes from the four cardinal points is now separated based on anisotropical Sky View Factor (SVF) images. 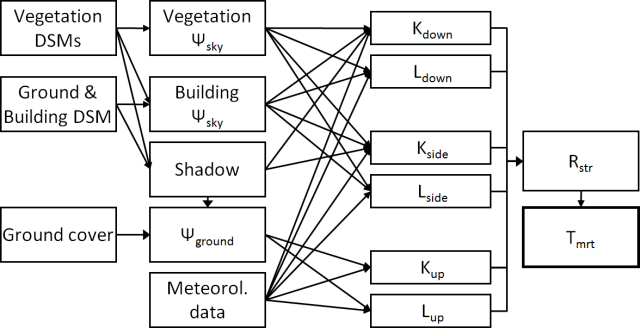 Ground View Factors is introduced which is a parameter that is estimated based on what an instrument measuring Lup actually is seeing based on its height above ground and shadow patterns. In order to make accurate estimations of GVF, locations of building walls need to be known. Walls can be found automatically be the SOLWEIG-model. However, if the User wants to have more control over what are buildings and not, the User should use the marking tool included in the ‘Create/Edit Vegetation DEM’. A very simple approach taken from Offerle et al. (2003) is used to estimate nocturnal Ldown. Therefore Tmrt could also be estimated during night in version 1.1. Höppe P (1992) A new procedure to determine the mean radiant temperature outdoors. Wetter Leben 44:147–151. Lindberg F, Grimmond CSB, 2011: The influence of vegetation and building morphology on shadow patterns and mean radiant temperature in urban areas: model development and evaluation. Theoretical and Applied Climatology. 105(3), s. 311-323. Lindberg, F., Onomura, S. and Grimmond, C.S.B (2016) Influence of ground surface characteristics on the mean radiant temperature in urban areas. International Journal of Biometeorology. 60(9), 1439-1452. Reindl D T, Beckman WA, Duffie JA, 1990: “Diffuse fraction correlation.” Solar energy 45(1): 1-7. Lindberg F, Thorsson S, Holmer B, 2008: SOLWEIG 1.0 – Modelling spatial variations of 3D radiant fluxes and mean radiant temperature in complex urban settings. International Journal of Biometeorology (2008) 52:697–713. Holmer B, Lindberg F, Thorsson S, Rayner D, 2015: How to transform the standing man from a box to a cylinder – a modified methodology to calculate mean radiant temperature in field studies and models. ICUC9 - 9th International Conference on Urban Climate jointly with 12th Symposium on the Urban Environment.